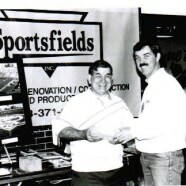 Sportsfields, Inc., a family owned and operated company, has specialized in the design, construction and renovation of the natural-turf athletic field beginning in 1984. Since then, Sportsfields, Inc. has been involved with over 1,000 athletic field renovations and creations. If you’re looking for construction, renovation, maintenance or supplies for your baseball diamonds, softball fields, soccer and football fields, we’ve got you covered. At Sportsfields Inc. we have focused our attention on the standards required to have a safe, affordable and playable athletic field, while providing outstanding and dependable service. For nearly 30 years we’ve been serving the area around Chicago, Northern Illinois, and Northwest Indiana. Sportsfields, Inc. carries a complete specialty product line including DURAPLAY ®, DuraBrick ™, and Verti-Drain , available for your staff to build, maintain or improve your athletic field. We also carry materials, bases, and supplies. For your convenience we offer full-service pickup, bulk deliveries and split deliveries. Sportsfields, Inc. has a comprehensive program to meet your specific needs, from designing the field to the construction and ongoing maintenance of your athletic field from start to finish.